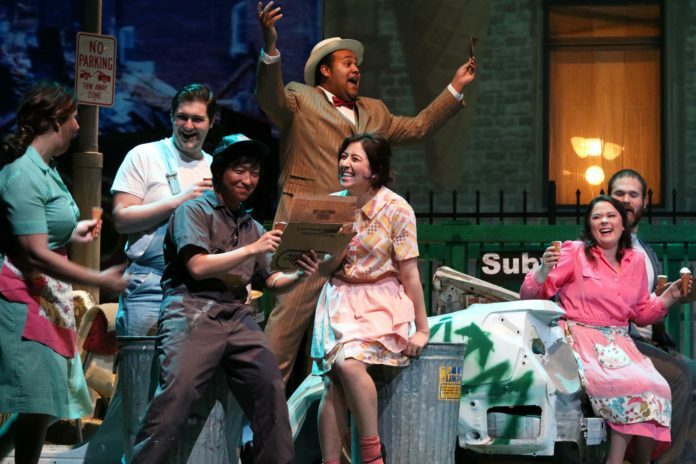 This weekend, the DePauw Opera transported audiences to 1970’s New York in a rendition of “Street Scene,” Kurt Weill’s 1946 opera. Weill’s opera is based on Elmer Rice’s Pulitzer Prize-winning play from 1929. The show takes place over two days in 1970s New York, where a group of foreign immigrants share an apartment building on Manhattan’s East Side and deal with being marginalized by the rest of the city. Filled with romance, murder, comedy, and Broadway-caliber music, “Street Scene” creates an emotionally powerful story. “We like to talk a little bit about how, before there was Leonard Bernstein’s ‘West Side Story,’ there was Kurt Weill’s ‘Street Scene,’” said the production’s musical conductor, Orchenith Smith. The opera is directed by Joachim Schamberger, visiting professor and guest stage director. Schamberger, a German immigrant and trained vocalist himself, moved to New York City to begin directing. Preparation for the production served to be a lengthy process, dating all the way back to last spring, when Schamberger and Smith selected Weill’s “Street Scene” as this year’s opera. Auditions to cast the story’s characters were held in September, with rehearsals starting during Winter Term after a semester-long trial of students memorizing their individual roles. Due to other projects in the music school, the student orchestra’s learning curve was a little behind that of the cast, having only begun to rehearse the music live last week. Apart from its effects and music, Street Scene’s message on immigration still resonates with American audiences in 2017. Martin’s character, Greta Fiorentino, is no exception in communicating this message.